Your Dog or Cat Won't Stop Eating Grass | What Should You Do? My Pet Won't Stop Eating Grass. What's Going On? Who hasn’t wondered, “Why does my pet eat grass?” The truth is there isn’t one clear reason. What we do know is that eating small amounts of grass can be a harmless, albeit curious, thing for a perfectly healthy dog or cat to do. But when nibbling turns into gulping great hunks of the stuff — and grassy vomit hits the kitchen tile — it’s time to wonder what’s going on. 1. Behavioral drives. Pica is a word used to describe eating things that do not serve a biologic or nutritional purpose — such as when a pet eats paper or plastic. It may be that the behavior feels good or there is some other behavioral reason. But a medical issue, such as a neurologic disease, can cause pica, so it shouldn’t be completely written off without discussing with your vet. 2. Nutritional cravings. Even though a dog or cat may be eating a nutritionally complete diet, that doesn't mean that cravings for certain things (such as grass) don't occur. 3. Idiopathic causes. Idiopathic means simply that the veterinarian doesn't know the exact cause. But you should continue to watch the situation. Does my pet eat grass voraciously? Does he vomit or feel sick afterward? Is there pattern? For example, does it also happen on days when he doesn’t eat all of his food? If you answer no to the first two, there’s probably no need to raise the issue with your veterinarian. If the answer to either is yes, it’s worth paying attention to No. 3. Armed with this information, owners can then present their findings to their veterinarians. 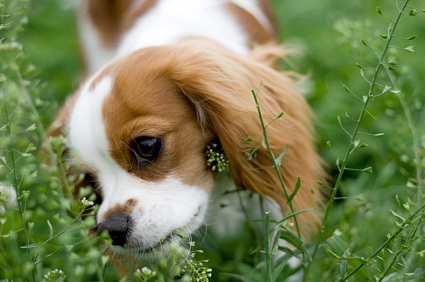 Your pet’s doctor will begin looking for a medical condition at work in the grass consumption. The goal is to figure out if it is a sign of a minor ailment, a more serious disease, or nothing more than normal albeit slightly eccentric behavior. Few grass-eaters are likely to have ever suffered an exploratory laparoscopy to surgically look into the contents of an abdomen and biopsy the gastrointestinal tract, but severe symptoms could theoretically lead a veterinarian to decide this is the best approach. Not every grass-eater has a serious medical problem, though. For many pets who want to sample the lawn, the prescription may be to let them go right ahead. Just make sure the grass is not treated with any chemicals that could be harmful if your pet eats them.